I came across the above sign on Java Street when I was checking on the progress of the latest Belvedere to grace our neighborhood this week. A flyer posted nearby provides more details. Looks interesting. 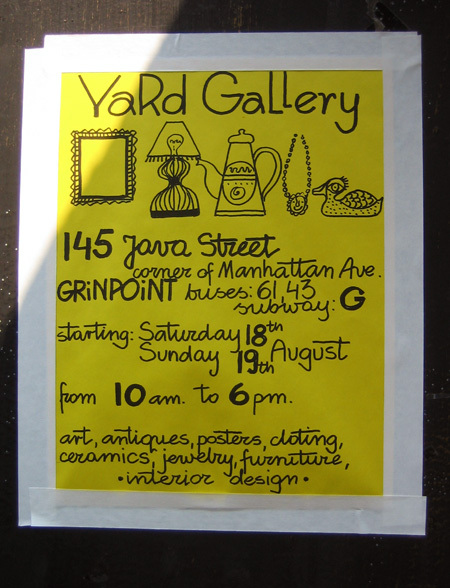 Given the sheer number of artists who live in north Greenpoint (myself included), a gallery/art space is long, LONG overdue. earlier this week, i was walking down Java and glanced at the aforementioned Belvedere. i agree, the construction is ugly as sin on that side of the street. however, on the opposite side, there are some of the prettiest gardens and window boxes i have ever seen. i contented myself with admiring those and averting my eyes from the Belvedere. one house has gone all out, with hanging planters, flowering vines and various potted pretties. you can hardly see the house or porch but the effect is stunning. 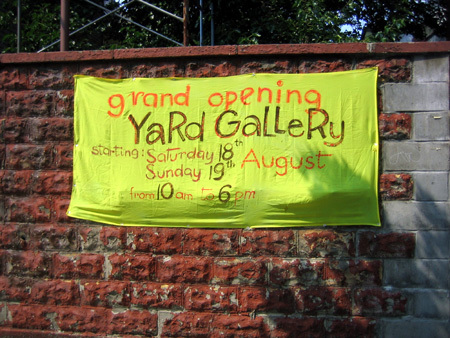 definitely going to check on that house again when i go visit the Yard Gallery event. I know which house you are talking about. I like their koi pond a lot. yes! i always try and see if they get any new fish. and it makes me happy that someone can keep a koi pond without hassle from vandals or litterbugs.